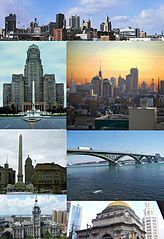 Buffalo is the second biggest city in the state of New York, and it’s found on the eastern edge of Lake Erie. Buffalo is a part of Erie County, and it has a population of over 260,000 people, according to a census from 2010. When you add in the residents from the rest of the Buffalo-Niagara–Cattaraugus area, you get a population of more than 1,200,000 people. The city has its roots as a small trading community all the way back in 1789. Find auto insurance in Buffalo. You may not have time to do everything when you are in the heart of the city because there is amazing architecture and world-class art available at every corner. If you are a true fan of the arts, then you may want to take a drive to Shea’s Performing Arts Center or Albright-Knox Art Gallery. When you need to get some shopping done, it’s usually a good idea to stick with Elmwood Village. That’s the spot where you will be able to find the large department stores a couple of different malls. If none of that interests you, then perhaps you’ll want to go to a Bills or Sabres game. Whether you are going to stay in Buffalo or make a trip out to Niagara Falls, you should always remember that car insurance is a requirement by law before you get into a car to drive. If you aren’t sure if you can afford insurance right now, take a look at the quotes available in the state by completing a search on newyorkmotorinsurance.com. John J. Grimaldi & Associates, Inc. Customer service oriented agency, which strives to provide accurate and timely services to the clients we serve.